In the summer of 1893, 1 out of every 4 people in the United States traveled to Chicago to see the World. The 1893 Columbian Exposition, a celebration of the 400th anniversary of Columbus' discovery, showcased the innovative wonders of the 19th century. Fairs and expositions were extremely popular at that time. Over 50 of them were held from 1851- 1889; each one trying to outdo those that came before. Few could compare with the magnificence and splendor of the 1893 Columbian Exposition. The Paris exhibition had taken place in 1889, with its commanding trademark, the Eiffel Tower. Congress saw the Columbian Exposition as an opportunity to display the growing economic and industrial strength of the United States. They strived to surpass the Paris exhibition in every possible way. 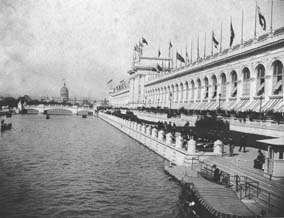 Congress' first order of business was to decide the location of the Columbian Exposition. There were many heated debates before Chicago finally won the right to host the fair. Embittered New Yorkers did not take the loss well. They nicknamed Chicago "The Windy City" due to long-winded oratories by the Chicago representatives. Chicago may be windy, but that's not where it got its nickname! Chicago had to get to work and build, just as it had done in 1871 after a large part of the city burned to the ground. The Fair became the symbol of the courage, energy and determination of the people of Chicago, and the motto, "I Will" was adopted. In three years, 633 acres of marshy land known as Jackson Park was transformed into a glorious fair. With immense architecture, scenic waterways and countless statues, Chicago created an ideal model city, and invited the world to come and display their best. The Architecture of the fair is worthy of study in itself. It made a permanent impression on American architecture and urban design, and became an example of what Fairs should be. The designers, trained in the "Beaux Arts" style, designed buildings grand in both style and size. Named the "White City, the 14 great exhibit halls were uniform in cornice height, geometrically logical and covered with white staff. It must have been a truly tremendous sight. To maintain their color, the use of coal was banned during the Exposition. The White City is regarded as the largest single common artistic undertaking ever. These vast buildings had a combined exhibit space of 63 million square feet, and every available inch was spoken for well in advance of the fair. 65,000 exhibits from around the world featured the latest technology in every conceivable field of study, from a 22,000 pound block of cheese to a stained glass exhibit from Tiffany & Co. The Midway Plaisance, an 80 acre strip of land connecting Washington Park and the rest of the Fair, was the first deliberately self-contained entertainment district. Here one could enjoy all kinds of fun: concessions, theaters, music, shopping and even snake charmers. There was a circus with wild animals, balloon ascensions and you could even kiss the Blarney stone. The first Ferris wheel, a massive ride 264 feet tall which could hold over 2,000 people at a time, became the trademark of the Fair. Even today, entertainment areas at fairs are known as "Midways." Many other famous firsts happened at the Columbian exhibition. The first elevated intramural railway was designed, a movable sidewalk carrying passengers at 3 miles per hour and the Kinetograph, an early version of the movie projector. The post office first introduced the picture postcards, and the first commemorative stamps and coins were created. Many new products were introduced, including Pabst beer, Aunt Jemima syrup and Juicy Fruit gum. My favorite is the introduction of diet carbonated soda and hamburgers to the United States.